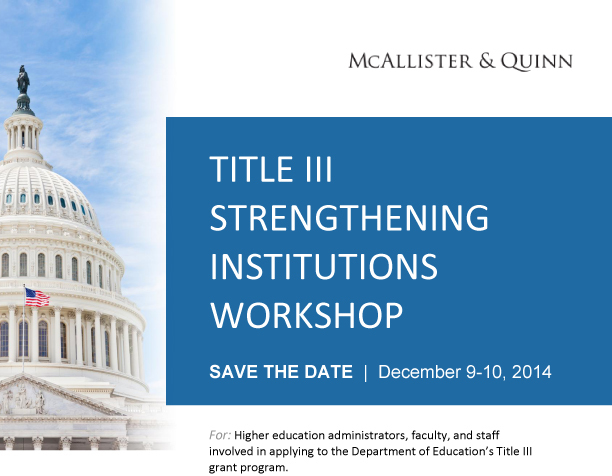 McAllister & Quinn’s Higher Education Practice Group will be hosting a client workshop on the Department of Education’s Title III Part A Strengthening Institutions program. The workshop will be held in Washington, DC, on December 9-10, 2014. Presenters will be discussing the fundamental components of the Department of Education’s Title III grant program. The program helps eligible institutions to become self-sufficient and expand their capacity to serve low-income students by providing funds to improve and strengthen the academic quality, institutional management, and fiscal stability of eligible institutions. The final workshop agenda will be distributed within the next few weeks. Clients should contact Dirk Rousseau (202-296-2741) for registration and lodging information.